Brazilian president Jair Bolsonaro arrived in Washington on Sunday to meet with his US counterpart Donald Trump and cement a budding conservative-populist alliance that, in part, aims to ramp up pressure on Venezuela. 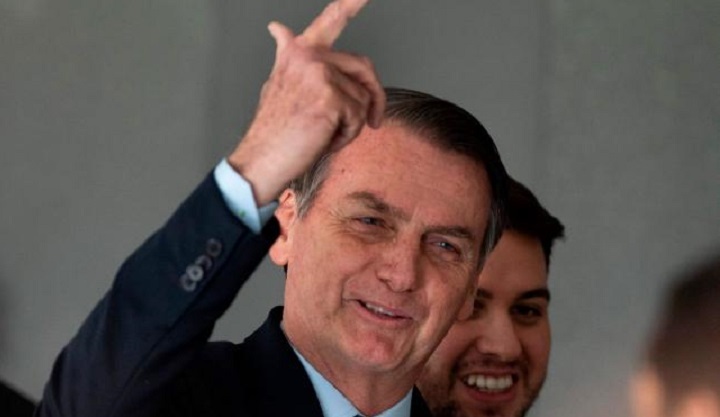 The far-right leader flew out of Brasilia early Sunday with six ministers, among them foreign minister Ernesto Araujo, economy minister Paulo Guedes and justice minister Sergio Moro, Brazilian media reported. They touched down at Joint Base Andrews, on the outskirts of Washington, at 3:40 pm (1940 GMT). "It's the first time in a long time that a Brazilian president who is not anti-American, comes to Washington," Bolsonaro said on Twitter after he arrived. It is Bolsonaro's first trip abroad for a bilateral meeting since taking office on 1 January. He attended the Davos summit in Switzerland in January. Bolsonaro, who will also meet in Washington with the head of the Organization of American States (OAS), is scheduled to return to Brazil on Tuesday. Outside the White House Sunday afternoon, dozens of demonstrators gathered to protest the visit -- holding signs including one that accused Bolsonaro of being a "murderer" over apparent links to suspects in the killing of rights activist Marielle Franco. Police have said those ties are coincidental. A Trump-Bolsonaro bond could see the leaders of the Americas' two most populous democracies working in concert on a range of regional issues. Most pressing is the crisis in Venezuela, where the United States and Brazil -- and dozens of other countries -- have recognized opposition leader Juan Guaido as interim president with the goal of pushing president Nicolas Maduro from power. The tough-talking Bolsonaro has long expressed his admiration for Trump. He echoes the US leader in spurning multilateral organizations and leftist politics, while promoting businesses over environmental concerns at home. Their shared nationalist sentiment can be seen in another relationship: that of Bolsonaro's son Eduardo, who is a federal lawmaker, with Trump's former strategist Steve Bannon. Eduardo Bolsonaro announced in early February that he was part of the Brussels-based group known as The Movement, which Bannon set up to promote far-right nationalistic values and tactics. The older Bolsonaro announced on Saturday that one main result of his trip would be the signing of an agreement under which the United States might gain access to a satellite-launching base in Brazil near the equator. But most eyes will be on developments surrounding Venezuela, which shares a border with Brazil. "Brazil and the United States together throw fear into defenders of backwardness and tyranny around the world," Bolsonaro said on Twitter, which he is a prolific user of, like Trump. "Those who fear ties with a free and wealthy nation? That's what we've come looking for," Bolsonaro added. Previous Brazilian administrations took a friends-to-all approach to neighbouring countries. But not Bolsonaro. The 63-year-old former paratrooper shares Trump's hostility to the "dictator" Maduro, who took over after the death of socialist leader Hugo Chavez in 2013. Trump has repeatedly insisted that "all options are on the table" with regards to Venezuela, a phrase understood to include military action. But Bolsonaro, like other members of the mostly Latin American Lima Group, has ruled out military action in favor of a policy of tightening the economic and diplomatic pressure against Maduro. As well as a "private meeting" with Trump in the Oval Office on Tuesday, Bolsonaro will sit down with OAS Secretary General Luis Almagro, and participate in various forums to promote economic opportunities in Brazil. The country's economy is the largest in Latin America, and the US is Brazil's second biggest trade partner after China. On Sunday night, Bolsonaro dined at the residence of Brazilian ambassador Sergio Amaral with "opinion makers" including, according to press reports, Bannon and US-based Brazilian writer Olavo de Carvalho, considered Bolsonaro's ideological guru. Wall Street Journal columnist Walter Russell Mead, American Conservative Union president Matt Schlapp and Chris Buskirk, who edits the blog "American Greatness" were among others expected at the event. Bolsonaro is staying in Blair House, the official US state residence opposite the White House used for visiting dignitaries. After his return to Brazil, Bolsonaro is planning a trip to Chile and then, in late March, to Israel.